The traceability system is not only for safety, but also for quality improvement. 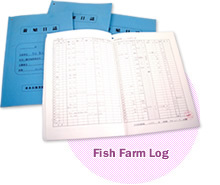 We administer the application forms for hatchery permission, the records of hatchery acceptance and application forms of vaccination as well as keep a log on each fish pen. Merchandise archive records on shipping help provide a clear production archive. 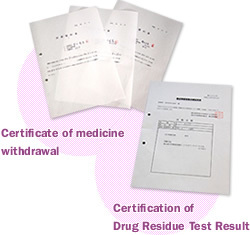 WWe record medications, manage the certificate of medicine withdrawal period, and perform the drug residue test for one amberjack per fish pen before shipping. The authorized inspection institutes checks the water and sediment quality (COD, sulfide) at the fishery grounds. It also monitors for any toxic chemicals and nutrients in the frozen feed, formula feed and the fish themselves in order to keep them safe and promote fishery products.